M T D N o v e m b e r 2 0 1 8 48 R / T T i r e s I s the alphabet soup known appropriately as the LT tire market big enough for another letter? Until recently, there were only three types of LT-sized tires: H/T for highway- terrain, A/T for all-terrain and M/T for mud-terrain. Now there may be the makings of an R/T, or rugged-terrain, tire, although the U.S. Tire Manufacturers Association (USTMA) does not yet acknowledge or track such a tire segment. But light truck tire manufacturers and marketers confirm consumers want a tire that fits in-between the A/T and M/T tire segments. 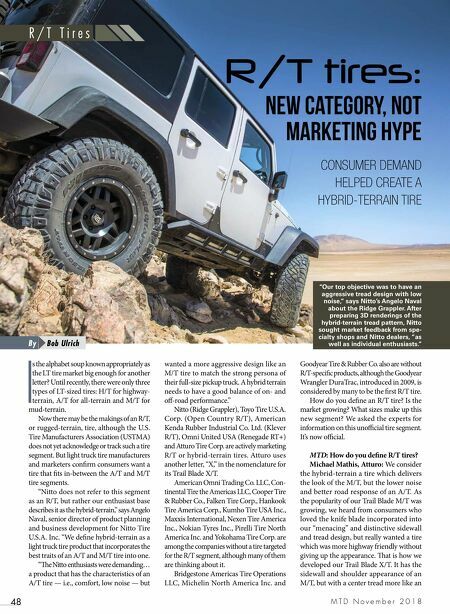 "Nitto does not refer to this segment as an R/T, but rather our enthusiast base describes it as the hybrid-terrain," says Angelo Naval, senior director of product planning and business development for Nitto Tire U.S.A. Inc. "We define hybrid-terrain as a light truck tire product that incorporates the best traits of an A/T and M/T tire into one. "e Nitto enthusiasts were demanding… a product that has the characteristics of an A/T tire — i.e., comfort, low noise — but wanted a more aggressive design like an M/T tire to match the strong persona of their full-size pickup truck. A hybrid terrain needs to have a good balance of on- and off-road performance." 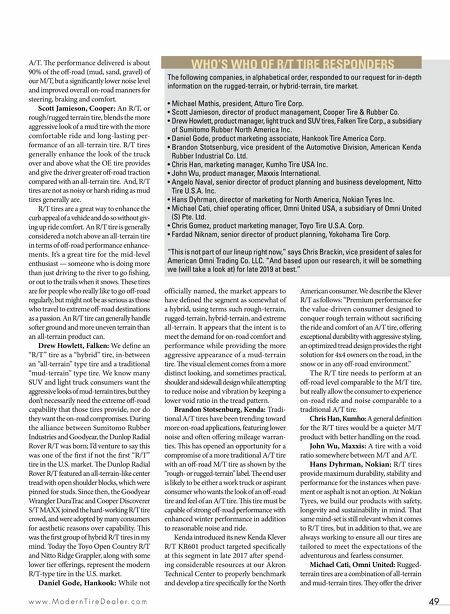 Nitto (Ridge Grappler), Toyo Tire U.S.A. Corp. (Open Country R/T), American Kenda Rubber Industrial Co. Ltd. (Klever R/T), Omni United USA (Renegade RT+) and Atturo Tire Corp. are actively marketing R/T or hybrid-terrain tires. Atturo uses another letter, "X," in the nomenclature for its Trail Blade X/T. American Omni Trading Co. LLC, Con- tinental Tire the Americas LLC, Cooper Tire & Rubber Co., Falken Tire Corp., Hankook Tire America Corp., Kumho Tire USA Inc., Maxxis International, Nexen Tire America Inc., Nokian Tyres Inc., Pirelli Tire North America Inc. and Yokohama Tire Corp. are among the companies without a tire targeted for the R/T segment, although many of them are thinking about it. Bridgestone Americas Tire Operations LLC, Michelin North America Inc. and Goodyear Tire & Rubber Co. also are without R/T-specific products, although the Goodyear Wrangler DuraTrac, introduced in 2009, is considered by many to be the first R/T tire. How do you define an R/T tire? Is the market growing? What sizes make up this new segment? We asked the experts for information on this unofficial tire segment. It's now official. MTD: How do you define R/T tires? Michael Mathis, Atturo: We consider the hybrid-terrain a tire which delivers the look of the M/T, but the lower noise and better road response of an A/T. As the popularity of our Trail Blade M/T was growing, we heard from consumers who loved the knife blade incorporated into our "menacing" and distinctive sidewall and tread design, but really wanted a tire which was more highway friendly without giving up the appearance. at is how we developed our Trail Blade X/T. It has the sidewall and shoulder appearance of an M/T, but with a center tread more like an R/T tires: Bob Ulrich By CONSUMER DEMAND HELPED CREATE A HYBRID-TERRAIN TIRE new category, not marketing hype "Our top objective was to have an aggressive tread design with low noise," says Nitto's Angelo Naval about the Ridge Grappler. After preparing 3D renderings of the hybrid-terrain tread pattern, Nitto sought market feedback from spe- cialty shops and Nitto dealers, "as well as individual enthusiasts."